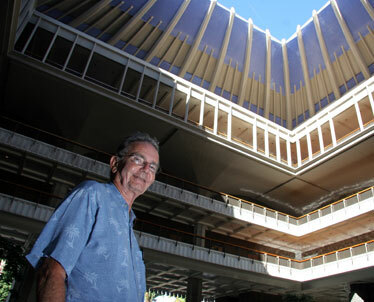 Alex Weinstein stands in the Hawaii State Capitol, which he sees as one of the more dramatic statements in architecture in the country. He conducts walking tours on Saturdays on request with his college friend Frank Haines. For the better part of the last 50 years, Frank Haines and Alex Weinstein have spent their Saturday mornings educating the public on Hawaii's rich architectural past, primarily in and around the Capitol district. » Call: 545-4242, ext. 12, for voice mail. Reservations required. On a 2-1/2 hour tour that covers 23 downtown Honolulu buildings, the former college roommates, acting as volunteer tour guides, expand upon the public knowledge of structures dating as far back as 1821, pointing out the Spanish and French influences upon architecture in the islands. 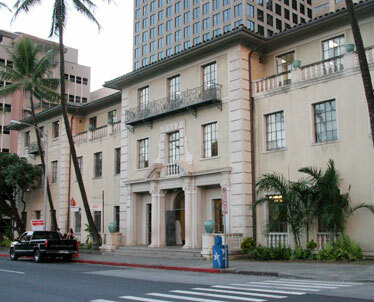 Popular stops include the original First Hawaiian Bank Building, Iolani Palace, the YWCA building, Hawaii Theatre and the Alexander & Baldwin building -- the block-long building fondly known as the A&B. And then there's Weinstein's favorite: the state Capitol, the $24.5 million-dollar structure built in 1968. Weinstein said it is one of the few capitol buildings on the nation that retains a sense of identity, as opposed to most government buildings typically constructed in Georgian or Classical Revival style. "It's one of the few that does not imitate Washington, D.C.," said Weinstein. "It's one of the more dramatic statements in the country." 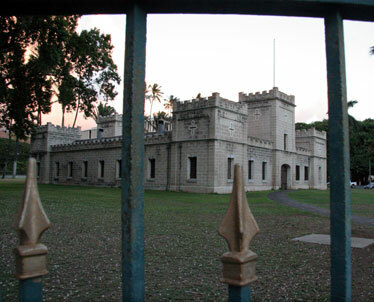 Constructed of 18-inch walls made of coral, the Iolani Barracks is an unusual site in Honolulu. Also known as Hale Koa, the barracks moved from its original site a block away in 1965. The downtown YWCA, at 1040 Richards St., was designed by Julia Morgan, an architect working out of San Francisco. Morgan was also responsible for the creation of Hearst Castle in San Simeon, California. 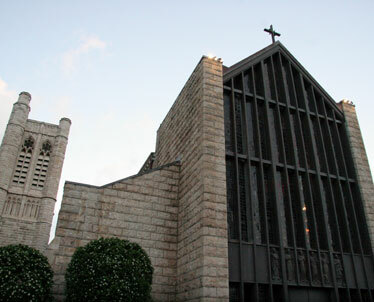 Chief architect John Carle Warnecke designed the layout of the sprawling structure. Elements such as earth, water and air are woven into the open-air design, and Hawaiian touches abound. Acacia koa decorates much of the door paneling, and furniture and artwork by Tadashi Sato and Ruthadell Anderson adorn the ground floor and inner chambers. Between the building's three upper floors and a garage and first floor that are hidden from view, the Capitol measures nearly 560,000 square feet. A stroll with the guides is like a walk back in time, into structures built in previous eras, particularly the 1920s and 30s, a time of architectural development in Hawaii. Several structures from this period were designed -- or inspired by -- architect C.W. Dickey, a longtime Honolulu resident who incorporated Asian and Spanish elements of design into the distinctive "California Missionary" style found throughout the islands. "Honolulu has been able to keep a lot of the buildings," said Weinstein. "We're very fortunate." 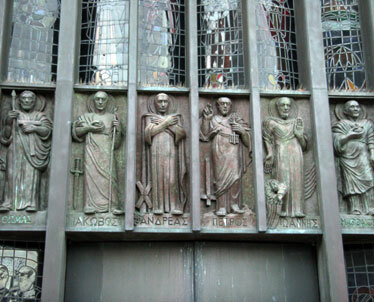 A detail from St. Andrew's Cathedral, far left, emphasizes the building's Gothic style. Kamehameha IV and Queen Emma set the plans for a European-style church in motion after a visit to England and a subsequent conversion to Anglicanism. The project also had the approval of Queen Victoria.